Any to PDF, DOC, TXT, JPG, TIFF, XPS. Any to PDF, DOC, TXT, TIFF, JPG, XPS. Your all-in-one converter. 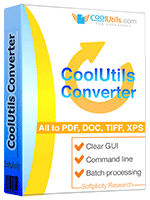 Coolutils Converter is the all-in-one solution for all your conversion needs. Whether you want to convert any to PDF or TIFF, it will do the task. The input file types include PDF, TIFF, DOC, TXT, XLS, HTML, PNG, JPEG, MSG, even Outlook emails. Bulk convert them in batches via GUI or command line with just one app. Any file to PDF; any file to TIFF; any file to DOC; any file to XPS; any file to JPEG, any file to TXT. Simple workflow: choose files, select target format, apply additional settings. Flexible settings: add headers, footers, page counts, date stamps or any other text directly into the documents. Perfect for archiving files, e-discovery, standartization, EDS. CoolUtils Converter is a great solution for exporting various files into EDS or retrieving data through e-discovery or computer forensics. 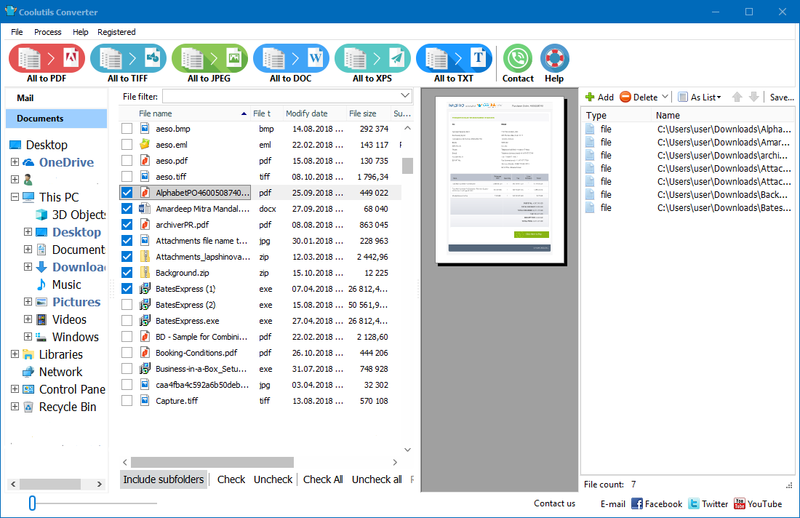 If you have to convert lots of different file types, Coolutils Converter saves your time and effort. Instead of running several apps you launch just one. Want more formats? We've been developing file converters since 2003, so we know a thing or two about all possible file types. Contact us and we will offer you a solution. Coolutils Converter is still easy-to-use. The app can be run via GUI or command line; we also offer a special server version without any interrupting messages. Give it a try, bulk convert your files with our free evaluation copy now! 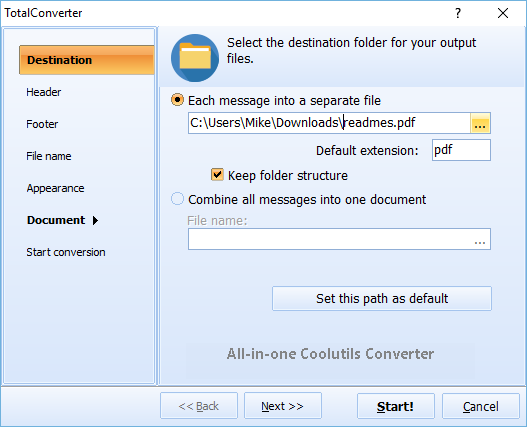 Coolutils Converter supports PDF, XPS, EPS, PCL, HTML, MHT, XHTML, DOC, TXT, DOCX, RTF, XLS, XLSX, XLSM, XLT, ODS, ODT, TIFF, JPG, MSG, EML, Outlook emails as input formats. Along with conversions you can add page counters or any text to each page of your documents. It works for bates stamping too. Any file to PDF? Set user permissions (view, print, edit, annotate, etc.) or protect your documents with a password. 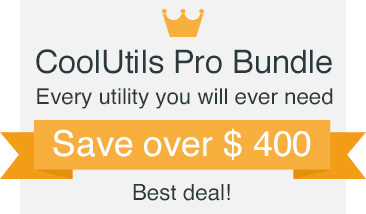 With Coolutils Converter you can convert emails (Outlook, Gmail, Yahoo, etc.) as well. Combine documents within folders? Our powerful batch converter can do that too. Coolutils Converter will help you to rename files adding counters or dates. Convert PDF, TXT, PNG, TIFF, RTF, XLS and many other files in seconds via our clear wizard-mode interface with a handy preview panel. The output file types include PDF, XPS, DOC, TIFF, TXT, JPEG! If you need to convert your files to other formats, simply let us know. We will be happy to add more target file types by your request. Have an outdated Microsoft Office 2003? Coolutils Converter supports all types of Word or Excel documents. To find the right file in seconds use our Filter tab or sort the file list by name, date, type, size. Select the file to preview it right in the app. Add image watermarks (i.e. your logo) to the header or the footer of the output file. When you convert any files to PDF you can sign them with your digital signature. Need silent conversion tool for your server? Cooutils ConverterX SDK will do the job (no GUI). Coolutils Converter can be run via command line (get the ready-to-use command line from GUI settings).